This Summer's edition of the Grenoble Ecole de Management (GEM) Energy Market Barometer documents the French energy experts' expectations of the impact of the Ukraine crisis on energy supply, the focus of energy policy in France, the economic implications of the energy transition, and the development of energy prices. The findings on the Ukraine crisis are also compared to a parallel survey in Germany, which was carried out by the Center for European Economic Research (ZEW). Half the French experts believe that the Ukraine crisis has worsened the security of natural gas supply in France. Appropriate responses to the Ukraine crisis include strengthening the EU energy market integration, and investing in pipelines and in liquefied natural gas infrastructure. The high perceived emphasis on energy efficiency in the current French energy policy is justified, but the focus on affordability for households and security of supply appears somewhat overrated. The French energy transition is expected to hurt utilities, but to benefit technology providers and the economy as a whole. Most experts believe the prices for electricity, gas, oil, and coal will remain relatively stable over the next 6 months, but they will increase over the next 5 years (except coal). 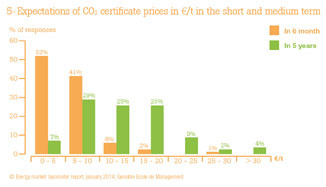 Expected prices of CO2 certificates have slightly increased since the previous barometer report, in particular for the medium term. The political crisis in the Ukraine has fuelled the discussion about the security of energy supply in the EU and its Member States. In 2013 the EU imported 66% of its natural gas and 88% of its crude oil consumption. Imports from Russia account for 39% of the total imported gas, and 33% of the total imported oil in the EU. France's import dependence for natural gas and oil is almost 100%, with Russia accounting for only about 15% of the oil & gas imports. In comparison, Germany imports more than 80% of its natural gas & oil consumption, with Russia accounting for about 37% of the oil and gas imports. We asked the energy market experts to assess the likely implications of the Ukraine crisis, focusing on the gas market. About three quarter of the French energy experts think that the current Ukraine-Russia conflict worsened Russia's reliability as a natural gas supplier, either slightly (58%) or strongly (18%). In comparison, the German experts' perception is less negative; 47% (12%) believe that Russia's reliability slightly (strongly) worsened. Half the French experts believe that the conflict has worsened the security of the natural gas supply in France, either slightly (47%) or strongly (3%). The other half mostly considers the security of supply to be unchanged. For the EU, the French experts expect more severe consequences; 81% believe that the security of natural gas supply has worsened, either slightly (61%) or strongly (20%). In comparison, 37% of the German experts believe that the Ukraine crisis has worsened the security of gas supply for Germany and 47% believe that the security of supply for the EU has declined. In the midst of the Ukraine-Russia conflict and because of outstanding payments, Russia has increased gas prices for the Ukraine and also cut off all supplies to the Ukraine. These actions have been interpreted as Russia's attempt to impose conditions on its delivery of gas as a means to advance its foreign interests. About half the French energy experts (54%) expect that in the future Russia will link the supply of gas to France with political demands. Almost 80% believe this will be the case for the EU. In comparison, only 27% of the German experts think that Russia will link gas supply to Germany with political demands, and 48% believe this will be the case of the EU. In response to this crisis, the EU and others have proposed several measures to ensure the security of the EU's natural gas supply. We asked our energy market experts to rate the usefulness of these measures. As for measures specific to natural gas, a vast majority of the French experts consider the following particularly appropriate: strengthening the EU energy market integration, investing in pipelines in other EU countries (i.e. outside of France), and investments in liquefied natural gas infrastructure. Almost half the experts (43%) consider the exploration of unconventional gas (e.g. shale gas) in Europe useful. The German experts come to a similar judgment, but they generally report lower approval rates for the individual measures. This suggests that the German experts tend to be more critical to the proposed measures than their French colleagues in our surveys. As for measures aimed at reducing the consumption of natural gas, over 90% of the French experts believe that improving energy efficiency would be a useful response to the Ukraine crisis. Approval rates for utilizing of renewable energy are also quite high (73%). 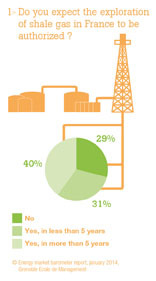 Almost half the French experts (44%) consider utilizing nuclear power to be appropriate. In comparison, the German experts also provide high approval rates for energy efficiency and renewables and low approval rates for coal. Unlike the French experts though, only 18% consider the utilizing nuclear energy a useful response to the Ukraine crisis. On 18 June 2014, Ségolène Royal, the French Minister of Ecology, Energy and Sustainable Development presented the main elements of the legislation to restructure the French energy system. The proposal set energy targets, which, among others, include an increase in the share of renewable energy sources in total final energy demand to 23% in 2020 and to 32% in 2030 (compared to 14% currently), and an increase in the share of electricity from renewable energy to 40% by 2030 (compared to 15% currently). The planned legislation further calls for a reduction in the share of electricity generation from nuclear reactors to 50% by 2025 (compared to 75% currently), a 30% reduction in fossil fuel use by 2030, a 50% reduction in final energy use by 2050, and a four-fold reduction of greenhouse gas emissions by 2050. This legislative proposal has spurred widespread debates in France centered on policy targets and implementation measures such as electricity tariffs for households and companies, capacity markets, a cap on nuclear power and developing an infrastructure for electric cars. To help assess the relevance of these debates we asked our experts to evaluate the most relevant aspects of the current and medium-term energy policy. The questions relate to the focus of energy policy and to the economic implications of the envisaged energy transition in France for the energy sector and the economy as a whole. We asked the experts in which area they see the current focus of the French energy policy, and in which areas the focus should be. We further asked in which areas the focus of the French energy policy will be in the next 5 years. For each question, respondents were requested to mark the three most relevant areas. About 50% of the experts think improving energy efficiency is a focus of the current energy policy, and about 60% believes this should indeed be the case. Energy efficiency is furthermore expected to remain an important policy focus in the next 5 years. The current debate about the French energy transition is dominated by the question of affordability for private households and companies. Interestingly, the experts believe that affordability for households (but not for companies) is overrated in the current French energy policy. Thus, while almost 50% of our experts think that affordability of energy prices for households is a focus of current energy policy, only one fourth think this is justified. Similarly, although 45% of the experts see the security of supply as a focus of the current and future energy policy, only 36% think this should be the case. We then asked our experts how they expect the French energy transition to affect the competitiveness of companies in the energy sector within the next 5 years. The responses reveal expectations about a differential impact across industries. Accordingly, 42% believe that the competitiveness of utilities will worsen, and 81% think that providers of power plant engineering and construction will benefit. For distribution companies and grid operators, experts' opinions are divided. Overall, almost 60% of our experts believe that the energy transition will have positive (46%) or very positive (13%) effects on the French economy in the next 5 years. In contrast, 23% expect negative and 3% very negative effects, while 10% do not expect changes. The GEM Energy Market Barometer also surveys the expectations of energy market experts about the development of energy prices in the wholesale market on a regular basis. We distinguish between the short term (6 months) and the medium term (5 years), and between the four main energy carriers: electricity, natural gas, oil, and coal. Most energy experts in our panel expect the prices of all energy sources to remain stable over the next six months. Only about one third of the experts expect an increase in the wholesale prices of electricity and a rise in the prices of natural gas and oil in the short term. In contrast, prices of all energy sources (besides coal) are expected to rise in the medium term. In particular, more than two thirds of the energy experts expect electricity, gas and oil prices to increase over the next five years. In general, these findings are quite similar to those of the Fall 2013 GEM Energy Market Barometer. In regard to the price of natural gas in particular, this corroborates the view that the repercussions of the Ukraine crisis on the natural gas market in France are rather marginal. The EU Emissions Trading System (EU ETS) regulates around half of the EU's greenhouse gas emissions by requiring more than 11000 power stations and industrial plants and also airlines to surrender a certificate for every tonne of carbon dioxide they emit. It is the EU's main instrument to meet its 2020 target to reduce emissions by 20% under 1990 levels. Since certificate prices were low, the EU decided in early 2014 to temporarily remove surplus permits from the carbon market by postponing the auctioning of a substantial amount of certificates from 2014 onward ("backloading"). Also, in its January 2014 EU framework on climate and energy for 2030, the European Commission proposed to reduce greenhouse gas emissions in the EU by 40% below the 1990 level by 2030. This target is expected to ensure that the EU meets its long-term objective of cutting emissions by at least 80% by 2050 in a cost-effective way. To achieve the overall 40% target, the installations covered by the EU ETS would have to reduce their emissions by 43% below the 2005 level by 2030, and thus by more than foreseen under the current regulation. Further, the Commission proposes to establish a market stability reserve at the beginning of the next EU ETS trading period in 2021. This market stability reserve foresees automatic adjustment of the supply of auctioned certificates depending on market liquidity. The final decision on the EU framework on climate and energy for 2030 is expected in the fall of 2014. Our experts expect the price of CO2 certificates to remain low over the next six months and to increase over the next 5 years. The median price is in the 5-10 €/t category for the short term, and in the 15-20 €/t category for the medium term. Thus, compared to the Fall 2013 GEM Energy Market Barometer and to prices of about 5.50 €/t (in mid June), expected prices of CO2-certificates are slightly higher, in particular for the medium term. So far, however, the "backloading" of emission certificates and the perspective of more ambitious future emission targets have not resulted in a substantial rise in expected certificate prices.